This article will give the basic guidelines for choosing your Guru; some are external practical points and others are internal—the feelings of your heart and the full acceptance within the inner reaches of your mind. 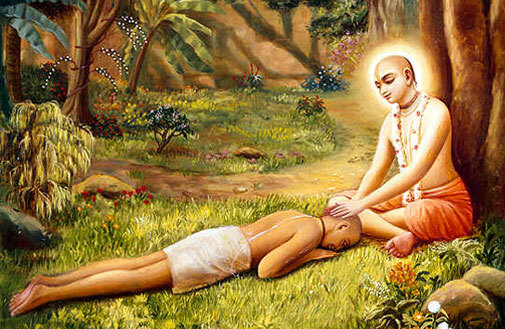 Before choosing your Guru, please deeply reflect upon all these points.Then sincerely cry while praying to the most merciful saviour, Bhagavan Sri Krishna, to give you clear, firm and perfect directions regarding choosing just the right diksa Guru to bring you to Goloka Vrndavana, and the eternal, sweet seva of Syama’s lotus feet. It is completely impossible for any conditioned soul to judge or determine the degree of bhakti within a Guru’s heart. No one can honestly say, “O, my Guru is a bhava bhakta!” “My Guru is a premi bhakta!” Or my Guru is a rasika Vaisnava!” To say so is merely speculation, sentiment and wish projection; a completely subjective statement. When defining the qualifies of a Guru no sastra says the Guru must be on the level of prema, bhava, asakti etc. 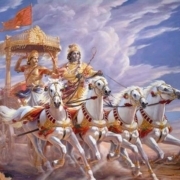 But they do say the Guru must have ANUBHAVA or experience of Krishna. This can mean a variety of anubhavas of which the topmost one would be saksad darsana, direct eye-to eye seeing of Bhagavan Sri Krishna. Indeed, this is a very, very rare occurrence attained by some special siddha purusha; possibly even one in a million! In our present 45 years of practicing Krishna bhakti bhajan, we have had the good fortune of associating with many greatly exalted and perfected GaudiyaVaisnava Babajis, sannyasis, Gosvamis and Vamsa acaryas. But, other than an occasional and involuntary display of crying while chanting the glories of Radha and Krishna, we never once saw any of these wonderful saints publically exhibit any sattvika bhavas or external signs or symptoms of Krishna bhava and prema. The following scriptural references (sastra praman) clearly define the qualities and characteristics of the genuine spiritual master—the Guru. By following these guidelines one can faithfully select the proper spiritual mentor, and surrender their lives at his/her compassionate lotus feet. 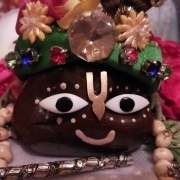 Jai Sri Radhe! The following verse is the main and primary one used by all acaryas to define the qualities of the real, true Guru. 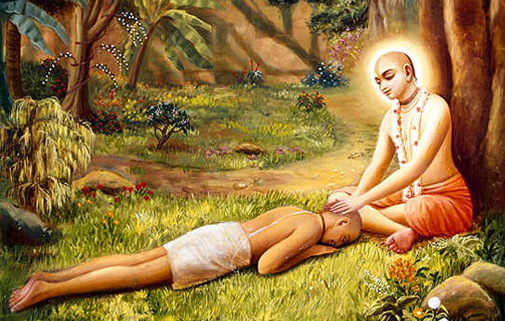 Guru exhibits warmth, care and feelings of parental affection toward disciples. If one lacks the above-mentioned characteristics, one cannot be accepted as Guru even if they come from a pious family and possess many virtuous attributes. Thus the fortunate and faithful person, who desires unlimited bliss in the eternal the service of Sri Sri Radha and Krishna, should take Gopala/Krishna mantra diksa from a great devotee endowed with these qualities, and learn the art of Krishna bhakti bhajan. “When the spiritual potency that distinguishes one as a competent teacher appears within a virtuous person, one should be regarded as a sad-guru. This occurs by the mercy of one’s Guru, and one’s sadhana bhajan which cleanses impurities from the mind and heart, and infuses one with devotion adorned with kindness and generosity. “Yes! I really love this teacher! I have full faith, and I have a strong, completely positive feeling in the core of my heart. I have no doubts whatsoever about this Guru. And I am fully convinced that I can completely surrender, give my full heart, and serve this Guru life after life!” Jai Gurudeva! However, if any of these qualities are lacking, then one needs to keep searching, crying and praying to Krishna to bestow just the right guru. Guru diksa ki jai! Jai Jai Sri Radhe! https://www.mahanidhiswami.com/wp-content/uploads/2019/02/lord-chaitanya-sanatana-goswami.jpg 329 505 dasi https://www.mahanidhiswami.com/wp-content/uploads/2017/08/mahanidhi-swami-radhakund.png dasi2019-02-04 11:40:202019-02-04 11:40:20How to Choose Guru?